After three months in the home of the family of Ahmad I moved to my own house. 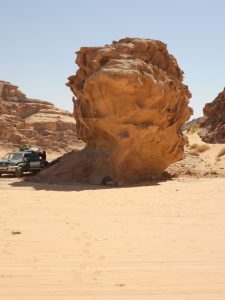 Ahmad wanted me to go to Disa, next to the Wadi Rum. But I was afraid. It’s not the best school to handle from this emotion. His brother found me a home next door and gave me the keys. I had to bring my stuff to the new home. The kids started to help me but after a few times running up and down they were tired. I moved on with everything I could carry. Ahmad pushed me to eat with his father who was alone since his wife had died after I was one month in the family. The last moment with her we were sitting on the veranda while she was talking to me. She was so tired. Older than 80 years, she still had 7 goats to take care for and her garden. I promised her to help with the garden to make her life a bit easier. Her daughter and daughter in law helped her with the goats. I never could imagine that this was our last real conversation. The went to the hospital short after. Came home again, I visit her, she was sitting as a queen in a plastic garden chair overlooking the whole room. Ordering everyone to bring tea and something to eat. A few days later she went to the hospital again. Came home to recover. When I visit her she was sleeping. The next day she was not with us anymore. Rest in peace my dear grandmother. I’ve learned so much from her. She was like a herbalist, knowing everhing of herbs, plants and other remedies of the desert. Always taking care for people, her grandchildren and other family. Once in the home of the grandfather I started to reorder all the wardrobes and kitchen shells and found her treasury of herbs everywhere. Together with her daughter we were recognizing her collection. Her daughter teached me how to use the herbs. Her husband is missing her. He started to tell me many stories of his life. He used to be an army man and had lived with his wife in many places. He was involved with the Palestinians during the making of the state of Israel in 1948. Other stories were about working together with the English when he worked with Glubb Pasha during the English mandate of Jordan and Palestine. But most of all I liked his stories about the camels and horses. How he bought camels in Saudi Arabia and brought them to Jordan which was not easy. Or from a horse that broke out from his uncles place and run all the way to Egypt. 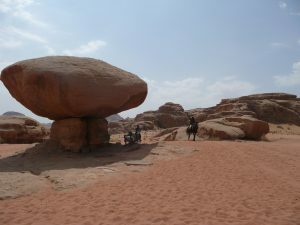 The village of Quwayra is in the south, only 40-45 kilometers from the Saudi and Egyptian border. His family used to live the Bedouin life in the mountains of Shafi, west to the desert highway of Quwayra. He was one of the first five families who build a home in the village of Quwayra. 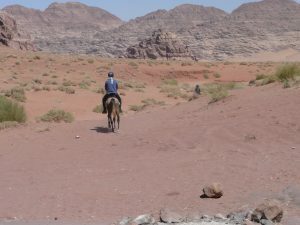 Close to the mountain from where Lawrence of Arabia with Abdullah bin Sharif Houssein, the protector of Mecca, and Oude Abu Teille went with a Bedouin army to conquer Aqaba from the hands of the Ottomans. After a few months I moved in with the grandfather as sometimes he was so dizzy that he fall down in the night. My Arabic language improved fast. I started to prepare the evening dish for both families. First only the Jordanian kitchen but slowly also other world kitchen meals. They liked most of my cooking and admired the different tasted. I find it startling how a man of more than ninety years is adopting different tastes. But he was once used to the some English cooking as well. 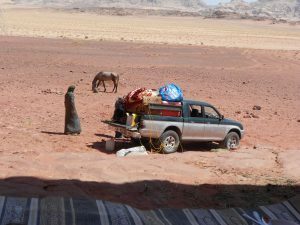 Once in a while I went to Wadi Rum with Ahmad when we had guests who wanted to stay in the desert. Still sleeping somewhere in the wild in the sands or under the rocks is the best thing one can imagine. Sometimes it was on a horse tour, sometimes the guests wanted to make a jeeptour. We were there with Abdullah the friend of Ahmad, crossing the desert sands. As I was most of the time in the home of Ahmad’s father, I moved my stuff back to his home and to the place where once the goats were. After grandmother died I found a dead goat in the herd. The goats were waiting their move to the daughter’s home, they were building a place where they could live. But once moved they died one by one till none was left. Still strange as if they only wanted to be with the grandmother. During the time I moved back Ahmad started to tell me things that I didn’t understand. More times out of nothing he told me to take care of his kids. While they had a mother. Also other things. He still wanted me to go to Disa to work with his friend Abdullah. But I couldn’t leave his father. He told me not to be sad whatever happens. 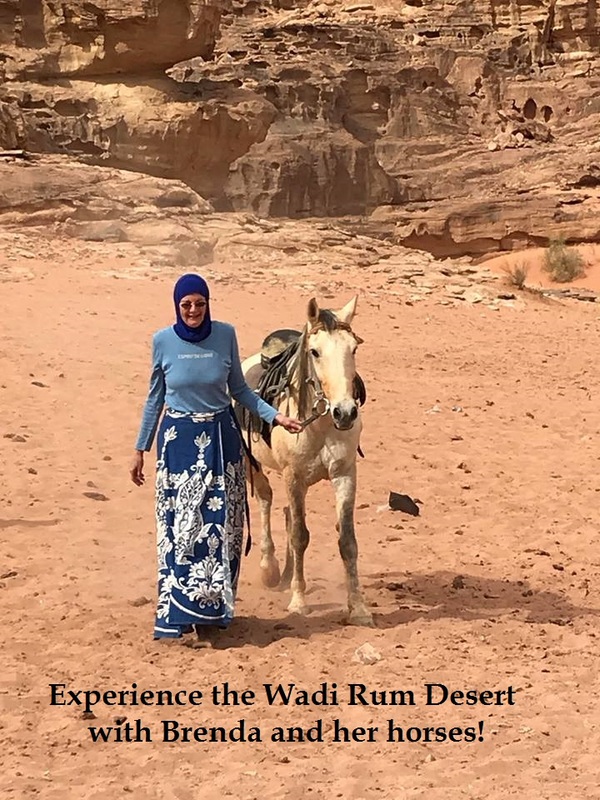 I was still recovering from my time in Wadi Musa but gained weight, was happy, although real working on the computer still was a thing of lack of concentration. I started a new website but couldn’t finish. He wanted to increase the tours with guests but I didn’t make the promotion to attract more people to Jordan. As if a hand was holding me back. 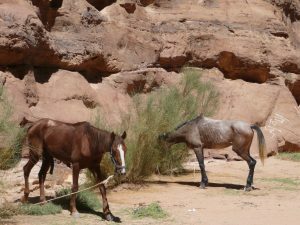 We had an upcoming horse ridig tour of six days from Humeima to the Umm Addami the highest mountain of Jordan situated on the border of Jordan and Saudi-Arabia and back to Disa. Ahmad told me to contact Abdullah by myself alhough he was always used to do this. A few day’s later I began to know what he already knew. On age thirty eight he died. His wife pregnant of number eight. His father leaving behind knowing his youngest son was not anymore with him. And then the sad times came to the homeof Ahmad. The parts of the puzzle falling together as he had tried to warn me in advance. I couldn’t believe that the one who was always there for me, the first one in Jordan who took me the way I was, who believed in me was not there anymore. He gave me all his trust. The next month there was the tour of six days on horseback. I had to contact Abdullah, now I understood why Ahmad pushed me to arrange everything with his friend. Abdullah took me from Quwayra to have a look at the horses in the tour. We went to another village and met Mehemmak, a very skinny horse, we couldn’t approach him well because he didn’t want any people around him. This would be my horse in the tour, he told me. On his back hand there were old wounds of abuse. I asked his owner to saddle and to ride him. I was scared to go on his back after I saw his behaving on the ground. I was surprised once I saw him walking, running and canter.I told Abdullah I would ride on Mehemmak My weight was still light. This horse needed a chance but I asked to feed him very well before the tour. The other horse Theeb was looking good. A strong white horse with a special glance in his eyes. Both were stallions. With Abdullah I made all arrangements and preparations of the tour as usual. The guest came, I met him with the driver at the airport in Aqaba. Immediately we went to Humeima where the horses and Abdullah would arrive soon. The two Bedouin on horseback stayed the whole tour with us. 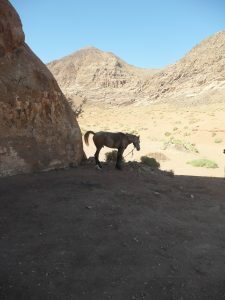 We slept next to the archaeoligic site of Humeima, the horses close to us. The next morning we would start the horse riding tour. My first time on Mehemmak, I was nervous being the guide on a horse I never ride before. But I had done this many times earlier after my horse Samiha was not there anymore. Once I stepped on Mehemmak and made myself comfortable on his back, talking nice words to him while taking the reins in my hand after a long pause not riding any horse I felt as a small kid knowing I can ride my bike. Mehemmak gave me immediately his trust while I gave mine. We were a team from the very first second although he didn’t want anybody on his back and made it very difficult to mount him. I guess the one who abused him never ride on him. Once on his back he showed me his kind character. Taking care of me, of the other horse and his rider, watching the car, knowing where to go although he didn’t know the program. I was in love with him. He was a good guide in the desert. From the age of maybe four years when I first stepped on a horse I never had ride such a skinny but such an amaible horse that still didn’t want anybody around him on the ground. 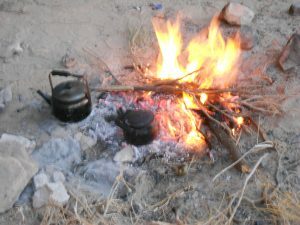 With the first stop for tea, the pick-up was hided behind a rock but Mehammak knew exactly where to find them I tried to dismount and slipped over him on the right side. There was nothing to hold on. Upside down I reached the ground. Afraid that he would do something to me. But he was just staring at me, the ice between us was broken. He would never harm me. In the contrary he protected me by bringing his nose to me to tell me it was alright to be with him. We found each other at that moment. A recognizing of woman and horse who both know what it means to have been abused. 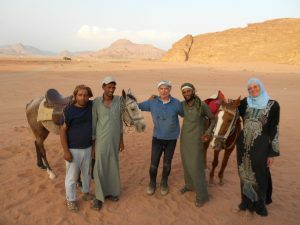 Next time an introduction of the desert (Bedouin) horses, Abdullah my colleague, started to collect.